A Union County jury has returned guilty verdicts on all charges against an Elizabeth resident who stabbed a man to death in a nightclub parking lot in 2016, acting Union County Prosecutor Michael A. Monahan announced Friday. 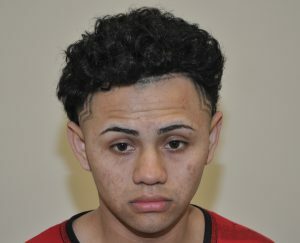 Rosendo Salomon Gomez-Serpas, 25, was convicted of murder and two related weapons offenses following a three-week trial before Superior Court Judge John M. Deitch and jury deliberations that took place over the course of two days. At approximately 4 a.m. on Saturday, April 9, 2016, members of the Elizabeth Police Department responded to the Imperial Latino Lounge on the 600 block of New Point Road and found the body of 30-year-old Mario Ortiz of Elizabeth, who was pronounced dead at the scene, according to Union County Assistant Prosecutor Peter Benza, who prosecuted the case. A fast-moving investigation involving the Prosecutor’s Office’s Homicide Task Force and High Tech Unit, the Elizabeth Police Department, and the Union County Sheriff’s Office’s Crime Scene Unit revealed that an argument between Gomez-Serpas and Ortiz that started in the nightclub ultimately spilled into the parking lot, Benza said. At that time Gomez-Serpas produced a knife and inflicted a total of five stab wounds on Ortiz, including three defensive wounds to his hand, as well as a final strike to his chest that proved fatal. Gomez-Serpas then fled the scene in a vehicle, but was located and arrested about 10 hours later at an apartment on the 500 block of Marshall Street in Elizabeth, after which he was lodged in Union County Jail on $1 million bail. Most of the encounter, including the fatal stabbing, was captured on nearby surveillance video, and the footage was played during the trial. Ortiz’s blood was also recovered from the hat Gomez-Serpas was wearing when he was arrested, as well as from parts of the inside of his vehicle. Sentencing in the case has been scheduled for Friday, March 23, 2018 before Judge Deitch, at which time Gomez-Serpas will face a term of 30 years to life in state prison.